The flagship expression of 1792 was launched in 2003. It is a rye-recipe bourbon with a higher-than-normal barley malt content, although the exact percentage has never been disclosed. It also features a yeast strain not used for any other brands. The product was created by Barton Master Distiller Bill Friel not long before he retired…. In case you’re wondering, bourbon made with wheat as a secondary grain instead of rye has always been a minority of all bourbon made, but it includes some very popular ones, not the least of which is Pappy Van Winkle. While rye is characterized by spice, wheated bourbons (which also include Maker’s Mark, Old Fitzgerald/Larceny, and the Weller family of bourbons) are known for a softer, sweeter edge. Sweet Wheat pours a light bronze color. It features a muted nose with honey, wood, and red fruit. On the palate, Sweet Wheat is as advertised. It’s soft and lush, with a little resin, oak, cherries, and apples. The finish is much of the same with apples and caramel. 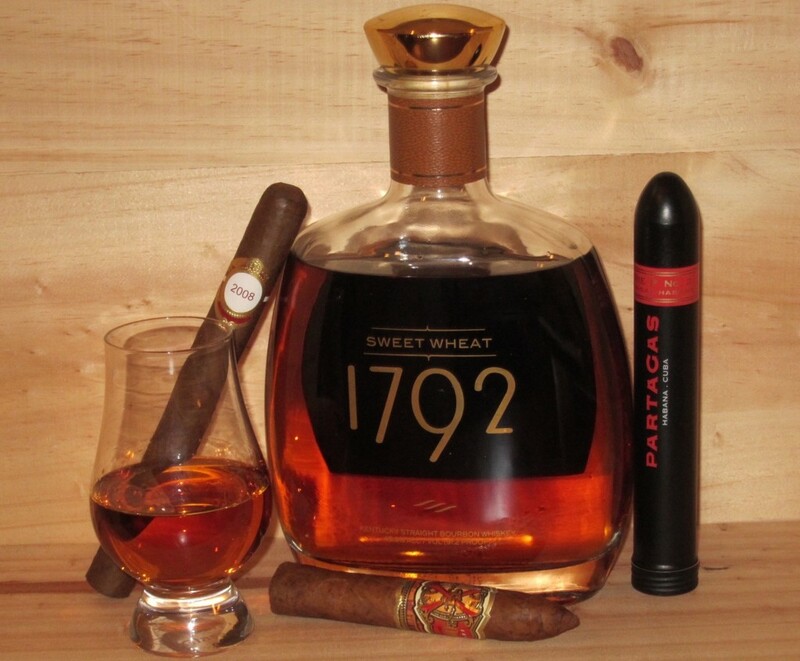 1792 Sweat Wheat Bourbon is 91.2-proof and retails for $33 a bottle. Though expect to spend bit more (I found one for $38) if you can find them at all (my local store sold out in two days) as the first release is fairly limited. Pair it with a balanced, mild or medium cigar. A few recommendations: Illusione Epernay, Paul Garmirian Gourmet Vintage 1991, Arturo Fuente King T Rosado Sun Grown, and Ashton Classic. I wouldn’t necessarily suggest spending a lot of time or money finding the new 1792 Sweet Wheat, but it is a good bourbon for the price. If you like Old Weller Antique, Larceny, or Maker’s Mark, it iscertainly worth trying. This bourbon sounds right up my alley. I am most definitely going to have to get this! Hopefully I can get my hands on one. Move quickly if you want to get some. The first batch has either just arrived or will be arriving soon in most states and reports are it is selling out quickly most places.